The automotive industry is touching new peaks each year, especially in the emerging economies, and its prosperity is reflecting highly positively on the global VVT & start-stop systems market, which is projected for a CAGR of 9.4% during the forecast period of 2017 to 2022. The growing need to increase fuel efficiency as a result of depleting oil reserves, stringent emission norms that have led to higher VVT standards, and hybridization of vehicles are some of the key factors augmenting the demand in the global VVT & start-stop systems market. While the growing demand for cam-less actuation and rapidly increasing preference of diesel cars will continue to open new opportunities for the vendors operating in the global VVT & start-stop systems market , factors such as increasing adoption of alternative fuels, high product cost, and substantial maintenance cost are expected to challenge the market from flourishing. Evaluated to be worth US$41,734.7 mn in 2017, the global VVT & start-stop systems market is estimated to be worth US$64,895.9 by the end of the forecast period, which is 2022. Based on product-type, the global VVT & start-stop systems market has been segmented into dual over-head cam (DOHC) and single over-head cam (SOHC). In the present scenario, the DOHC segment is most profitable, exhibiting an individual CAGR of 9.0% during the forecast period of 2017 to 2022, when it is estimated to be worth US$37,922.9 mn. The dual over-head cam segment is foreseen to produce a revenue of US$2,657.5 mn annually for the next five years, and its absolute growth is larger than any other segment. By the end of 2022, DOHC segment is projected to constitute 58.4% of the overall demand in the global VVT & start-stop systems market. Technology-wise, the market for VVT start-stop systems has been bifurcated into cam phasing, cam phasing plus changing, belt-driven, direct starter, enhanced starter, and integrated starter. As a result of increasing demand for performance-oriented fuel-efficient vehicles as well as stringent emissions regulations in several developed countries, the adoption of advanced VVT systems such as cam-Phasing plus changing systems is anticipated to be higher in North America and Asia-Pacific. Based on fuel type, the global VVT & start-stop systems market has been classified into gasoline and diesel, whereas application-wise, this market has been categorized into compact passenger cars, mid-sized passenger cars, premium passenger cars, luxury passenger cars, light commercial vehicles, and heavy commercial vehicles. Geographically, the region of Asia Pacific except Japan (APEJ) is most profitable in the global VVT & start-stop systems market, projected to represent opportunities worth US$22,947.1 mn by the end of the forecast period, which is 2022. This substantial chunk of demand is more than any other individual region studied under this report. The demand in the APEJ VVT stop-start systems market is expected to increment at an above-average CAGR of 10.2% during the said forecast period, gaining traction from increased manufacturing of vehicles equipped with these systems as well as increasing disposable income among the urban populations residing in this region. North America makes for the second most lucrative region for the vendors operating in the VVT & start-stop systems market, expanding at a CAGR of 9.5% between now and 2022 to reach a valuation of US$11,589.2 mn. Denso Corporation, Mitsubishi Electric Corporation, Schaeffler AG, Robert Bosch GmbH, Continental AG, Hitachi Ltd., BMW, Eaton Corporation plc, Magna International Inc., Delphi Automotive PLC, Toyota Motors, Johnson Controls, Inc., Aisin Seiki Co. Ltd., and Valeo S.A. are some of the key companies currently holding a position of strength in the global VVT & start-stop systems market. This report on the global VVT & start-stop systems market has been developed by professional market research analysts and aspires to serve as a credible business tool for its targeted audiences such as automotive electronic system manufacturers, investment firms, VVT and start-stop system manufacturers, private equity firms, automotive component manufacturers, and vehicle manufacturers. 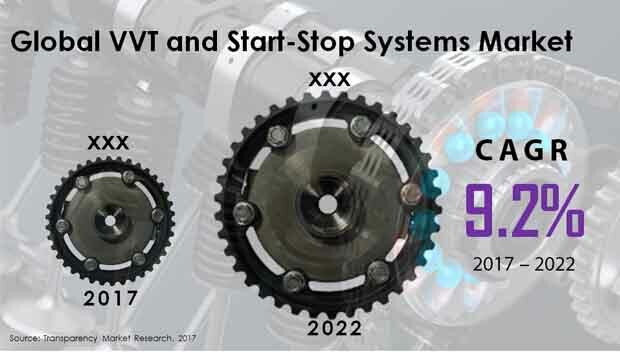 This report projected the demand for VVT start-stop systems to increment at a healthy CAGR of 9.4% during the forecast period of 2017 to 2022. Rapidly decreasing oil reserves, strict emission norms, increasing fuel prices, and hybridization of vehicles are some of the key factors augmenting the demand in the global VVT & start-stop systems market, although high cost of these products and substantial maintenance cost are a few hindrances challenging the prosperity. This research is a careful summation of two parts, primary and secondary research, which were conducted specifically to understand and arrive at trends before using them to forecast the expected revenue of the global VVT & start-stop systems market. A major chunk of our research efforts depended on information collected from in-depth interviews and discussions with a number of experts of the industry as well as opinion leaders. On the other hand, the secondary research for the development of this report included study of company websites, press releases, annual reports, various international and national databases. The logic behind the secondary research was for the report to provide qualitative and quantitative estimated market size in terms of US$ Mn for each product, technology, fuel type, and feature type. In addition to that, the report provides estimated market size in terms of US$ Mn for various geographic regions for the period 2017 to 2022, considering the macro and micro environmental factors. To evaluate the revenue generated from each product, the report has considered their launch date in the market, customer acceptance, price of the product, volume sales, trends in industry, and adoption rate across all the geographies. On the basis of product-type, the global VVT & start-stop systems market has been segmented into dual over-head cam (DOHC) and single over-head cam (SOHC). In the present scenario, the DOHC segment constitutes the most prominent chunk of demand and is projected to increment at a CAGR of 9.0% during the forecast period of 2017 to 2022, when it is estimated to be worth US$37,922.9 mn. Technology-wise, the market for VVT start-stop systems has been bifurcated into cam phasing, cam phasing plus changing, belt-driven, direct starter, enhanced starter, and integrated starter. Based on fuel type, the global VVT & start-stop systems market has been classified into gasoline and diesel, whereas application-wise, this market has been categorized into compact passenger cars, mid-sized passenger cars, premium passenger cars, luxury passenger cars, light commercial vehicles, and heavy commercial vehicles. Geographically, this report categorizes the global stretcher chair market into North America, Europe, Asia Pacific except Japan (APEJ), Latin America, and Middle East & Africa, and Japan. The current size of the market and its futuristic prospects for each of these regions has been provided for the period from 2017 to 2022, along with their respective CAGRs for the forecast period from 2017 to 2022, considering 2016 as the base year. One of the key aspect of this report is that it provides market size and forecast for major countries in the respective regions. The region of North America include the U.S. and Canada, Latin America includes Brazil, Argentina, and Mexico, Europe includes the U.K., Germany, France, Spain, Italy, and Nordic, APEJ includes China, India, Thailand, Singapore, Malaysia, and Australia, and MEA includes GCC countries, South Africa, Israel, and Nigeria. Denso Corporation, Aisin Seiki Co. Ltd., Robert Bosch GmbH, Continental AG, Magna International Inc., Delphi Automotive PLC, Hitachi Ltd., Toyota Motors, Johnson Controls, Inc., BMW, Eaton Corporation plc, Valeo S.A., and Schaeffler AG are some of the prominent companies of VVT & start-stop systems market who have been profiled in this report.